New for 2018, Liberty is pleased to introduce its top-selling Lincoln safes in a beautiful new logo design, available in nine (9) gloss finishes. 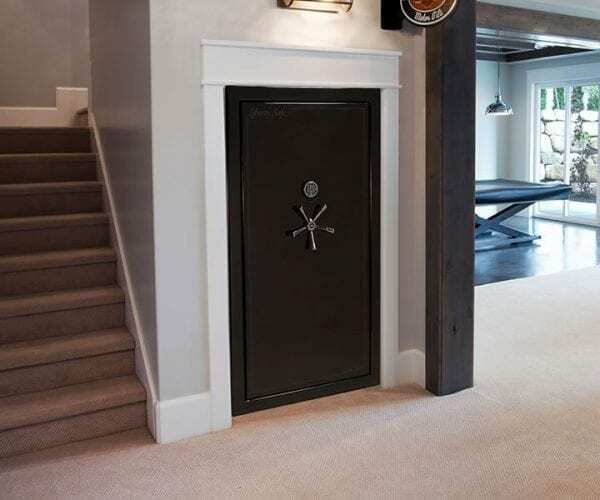 The top-ranked Modern Liberty Lincoln safes offer state-of-the-art fire and security features unmatched anywhere – 90 minutes fire protection, an unyielding 5-inch thick door, solid 1.25″ bolts, and internal ball-bearing door hinges that give a life time of smooth, balanced access. Organize your valuables with Liberty’s Premium Door Panel, jewelry drawer, padded shelving, and auto on/off interior lighting. And, frustrate the thieves with Liberty’s upgraded ball-bearing hard plates that snap drill bits. 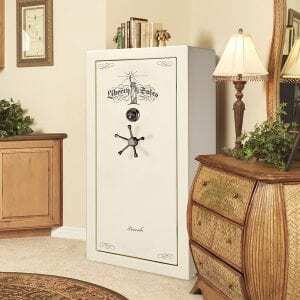 These fire rated gun safes for sale are available in four sizes. The Lincoln series was voted the #1-rated safe by sportsmen and hunters across the U.S. Go nostalgic or go modern, the Lincoln and the Modern Lincoln are perfect for every decor. Form, function and class, the ideal features brought together in Liberty’s new Modern Lincoln safes. Look inside for heavy-duty chrome door bolts, two inches of steel and fire board all around, 90-minute fire rating, a jewelry drawer, door panel, and a 5-inch thick door. Look outside and choose from four sizes with nine gloss finishes for the perfect classy blend of form and function. Liberty Safe Lincoln Series reliable Tough Door includes larger bolts (1.25″), longer bolt extension (33% longer), anti-pry tabs (defeat prying), and NEW over-center DX-90 MONSTER MECH to prevent side bolt punching.